Carmen L Mueller, MD, Pepa Kaneva, MSc, Gerald M Fried, MD, Liane S Feldman, MD, Melina C Vassiliou, MD. Montreal General Hospital, McGill University Health Centre. Ensuring proficiency in endoscopy has become a major priority for general surgery training programs in recent years. The Fundamentals of Endoscopic Surgery (FES) test is a high stakes examination testing proficiency in flexible endoscopy. The test includes a manual skills component administered on a virtual reality endoscopy simulator. The objective of this study is to determine the association between clinical colonoscopy skills and performance on the FES manual skills test. Participants included FES-naïve general surgery residents and gastroenterology fellows at all levels of training, as well as attending physicians who regularly perform colonoscopy. Performance on live colonoscopy was measured using the validated GAGES-C global rating scale, and performance on the FES manual skills test was measured using a validated, computerized scoring algorithm based on efficiency and precision. Each trainee completed the two assessments within 2 weeks. Statistical analyses included Pearson’s r test of correlation. A total of 20 participants were enrolled (median age: 29; 52% male). Of these, 6/20 had performed 26-50 colonoscopies, and 7/20 had performed 51-100 upper endoscopies (range: 0->200). The median FES score was 68 and the median GAGES-C score was 13/20. 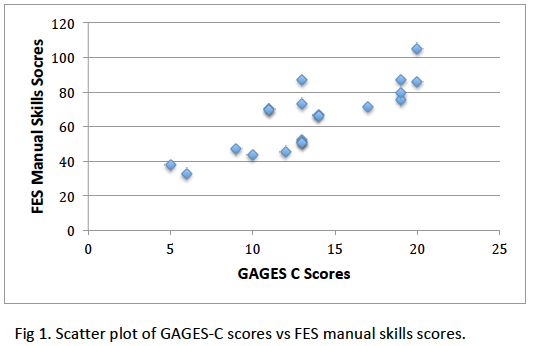 Pearson’s correlation between GAGES-C scores and FES manual skills test scores was 0.82 (see Fig 1). All participants who scored >15/20 on the GAGES-C achieved a passing score on the FES manual skills test. There is a strong correlation between clinical colonoscopy performance and scores achieved on the FES manual skills test.